I've never met this postion before, and i'm starting to think it's an "illegal" one because i lend it to a friend before and he said he had to glue some fallen stickers. Am i missing an alorithm or do i have to disamble the cube? Yes, this is impossible to do on a 5x5x5 using normal moves only (assuming only the two visibly wrong corner pieces are swapped and all the rest is solved). An easy argument to see why: By ignoring slice 2 and 4 in every direction, slices 1, 3, and 5 essentially form a 3x3x3 cube. In your case those layers form a 3x3x3 with two corners swapped. 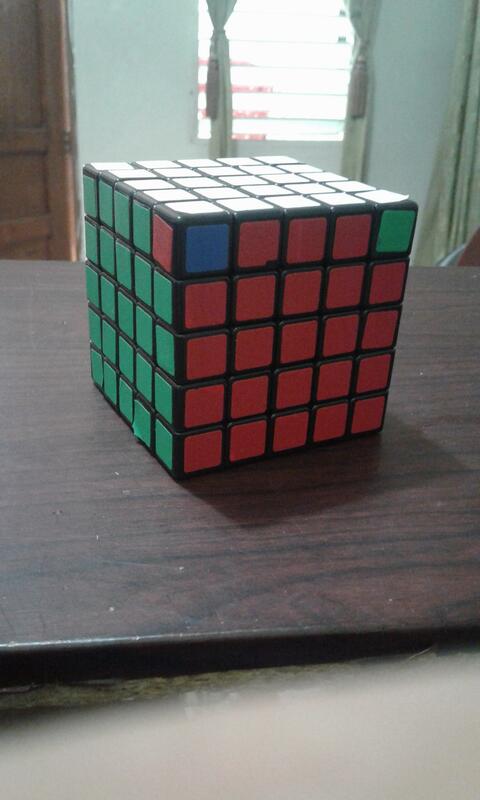 It is well known that it impossible to swap two corners on a 3x3x3 cube without disturbing any other pieces. This is because every move is an even permutation of the pieces (4-cycle of edges combined with a 4-cycle of corners), whereas a single swap of corner is an odd permutation. Therefore some of the stickers of the corners or the middle edges must have been rearranged wrongly. It's impossible to prove that a position is valid merely by showing three faces, but showing three faces may sometimes be enough to prove that a position is invalid. This is one of those times. Knowing two sides of a corner piece is enough to infer the third, so it's possible to tell that the two top front pieces are swapped (the unseen face of the top front right corner is red) and that the far top left and bottom front left pieces are correctly positioned and oriented. Knowing the positions of three corners of a side, and seeing the side's color on a fourth piece, makes it possible to identify the other two colors of that piece. It is thus possible to infer from the picture that all three of the corner pieces that have exactly one side showing are correctly placed. Having accounted for the positions of seven corner pieces, it's possible to infer that the eighth must also be correctly placed. Consequently, the only way the stickers on the cube could be "correct" would be if it had been disassembled and the two top front corners swapped. If you're genuinely asking, you should show the other sides. If it were in a valid position, it would be impossible to know that from the picture. Which leads to the conclusion that if you already know whether it's a valid position and you're asking just as a puzzle, then the answer must be "no", because otherwise it would impossible to answer.